How to choose a Taxidermist? Kantor's Taxidermy is a full service taxidermy studio located in the St. Louis, Missouri Area. 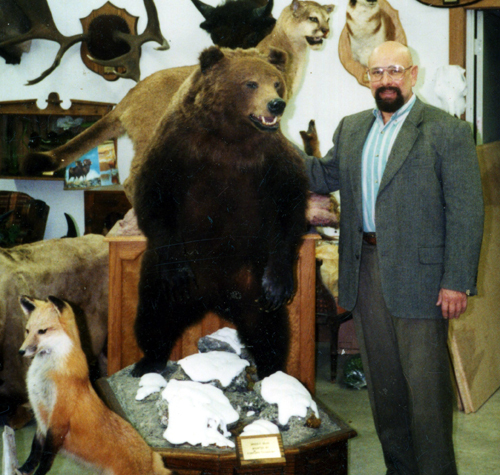 Paul Kantor has been a Master Taxidermist for 44 years and has spent every day mastering his profession. Specializing in game heads, life size mounts, game birds, reproduction fish mounts, skin mounts, and reptiles. He provides a quality service and attention to detail that is unmatched in the industry. He is truly a Master Taxidermist with an Artist’s Eye. He has mounted wild game from all over the world, from countries like Africa, South America, North America and New Zealand. All kinds of Exotic and European specimens; African cats, Rhino, Hippo and Crocodiles; everything from the smallest Dik Dik to the large African Elephant. He prides himself in quality work and dedication to detail, to make sure that his customers get an excellent value. This is not just a way for him to make money, it is a passion for him. Paul offers Custom Bases & Habitat Scenes that are out of this world! He also puts a LIFETIME WARRANTY on all his work! I have been hunting wildlife for over 30 years and over the last decade I have harvested my share of trophy animals. I have also seen my share of taxidermists and I have to say, there is a huge difference between your normal taxidermist and your MASTER Taxidermist. Paul is a true Professional, the Artist that truly makes your wildlife come back to life. When he is done, your trophy will be something you cherish for decades to come. Something your children would like to inherit. I believe in Paul so much that I told him I would build this site for him free of charge. I will never take my cherished trophies to anyone else.